The focal length of anamorphic lenses is different from sherical ones. The anamorphic element changes the horizontal angle of a lens by a factor of 2, but leaves the vertical angle untouched. So in fact you have the characteristics of two focal lenses combined in one. A 50mm anamorphic lens for instance has the vertical angle of a 50mm lens, but the horizontal angle of a 25mm lens. This also influences the depth of field. To be safe one should calculate the depth of field based on the actual focal length of the lens. In the case of the 50mm, one would calculate the depth of field based on a 50mm lens, and not a 25mm lens. This means that a 50mm anamorphic lens, although it covers the same horizontal angle than a 25mm spherical lens, only has half of the depth of field than that spherical 25mm lens. Almost all the problems, the distortions, chromatic abberations, shallow focus, tricky focus-pulling, can be minimized simply by shooting at a decent stop. Anamorphic lenses have what is known as a "curved field of focus" that works similarly to the curved movie screens in some large Cinerama theatres. This is one reason that one needs to expose these lenses at a deeper stop. If one doesn?t, the curved field will not be covered by depth of field and either the edges or centre of the frame will be soft. The other reason is contrast that translates into apparent sharpness. With more contrast, the image appears cleaner and sharper. Anamorphic lenses look best sharpness and contrast wise when stopped at least 2 stops down. T4 or T5.6 are great anamorphic stops. It is not a good idea to expose deeper than a T11 either. Optically, a lens' performance will deteriorate after that. A lot of these lenses don't focus closer than 4 feet, some only to 7 feet, unless one can wrangle some closer-focusing lenses. It is a good idea to carry some diopters. The breathing is so prominent because of the change in compression, unless one is really stopped down, that one should think carefully about when to rack-focus and when to just hold focus -- don't ping-pong it during a two-shot dialogue scene. A little more of a problem than with spherical primes due to the anamorphic element at the front of the lens. On the other hand anamorphic flares can be very nice and be part of the look. Each anamorphic lens even of the same series (except the very latest ones) has different characteristics in color, contrast and sharpness. The quality of these older lenses does vary and one needs to test them find the best ones. What to look for in lenses is that they are flat (curved field of focus), contrasty and have as neutral a color as possible. Some are warmer or colder than others. Try to get as many similar millimetres as possible to compare to. Not only project the lenses at the rental house to evaluate these performance variables but shoot a lot of film on a focus chart that has targets all over the field of view. Shoot wide open and stopped down. Also shoot film outside at deep stops to make sure the shutter blades do not vignette the wide format. They shouldn't but the older lenses used to. Panavision used to have the edge over PL mount cameras (ARRIs and Moviecams), because their cameras were designed with anamorphic in mind. The viewfinders on their cameras are switcheable from spherical to anamorphical. ARRI kind of missed the boat on anamorphic in the nineties, because they geared their cameras more towards Super35 and 3 perf. However that problem has been solved with the new Arricams. They now come with an Universal Viewfinder which, just like on Panavision cameras, is switcheable between spherical and anamorphic. They have the largest selection of anamorphic lenses available. The 4 main series are (from the oldest to the most recent) C-Series, Super (High) Speed, E-Series, Primos (regular and close-focus). It is important to keep in mind that while the Primos are all color matched and have identical characteristics (minimum focus, breathing, sharpness, contrast), all the other lenses are mostly one-offs and their characteristics (including minimum focus and weight) will vary from lens to lens. As said previously one needs to test to find the best lenses. Also the people at Panavision will have a good idea which lenses are good and which are to avoid. DOPs who shoot a lot of anamorphic often write down the serial numbers of the lenses that they like, so as to be able to request them again next time. Panavision's scope lenses feature the non-mumping system. The "hump" on auto-panatars is the gear system which orientates two anti-astigmatic lenses and eliminates ?anamorphic mumps? when shooting close-ups. This was Gottschalk's design. In a lot of people?s opinion, the "C" and "E" series seem to be the lenses of choice over the Primos. The C and E series are smaller and lighter than the Primos and are optically similar or even better in some cases. The Primos are fine lenses but are huge and heavy. It is very hard to do Steadicam with them. The 50mm Primo is over 7 kilos for instance. Hand holding would be very challenging with the Primos. The advantage of them is that they focus much closer than the other series. The suggestion of carrying diopters is a good one with the C's and E's. It has been said that when the older anamorphic lenses were build, Panavision Woodland Hills kept the best ones and send the other ones to London where again they tested the lenses, kept the better ones and send the other ones on. It looks like there is some truth in that, since a lot of American DOPs who shoot anamorphic abroad bring their lenses with them. All of Panavision?s lenses have the anamorphic element up front, which is why they are more prone to flares. The C-series are bit lower in contrast than the E-Series and Primos. They are the lightest Panavision lenses available. Most people who shoot on Primos still carry C-Series for Steadicam. Their housings appear to be brass whereas the E-series seem to be aluminium. The glass inside the C40, C50, C75, and the C100 are Cooke. The C60 is Zeiss throughout (there are very few of this focal length). Minolta and Pentax did some of the glass on the wider lenses in the C series. Not sure who did the cylindrical element group though. If you go with the C-Series, get the E-Series version of the 180mm because the C180mm only focuses down to 7'. Recently Panavision have combined E-Series glass with C-Series mechanics. These lenses have better contrast and color rendition than regular C-Series, as well as better close-focus. The first films to use these lenses were ?The Island? and Terrence Malick?s ?The New World? which features stunning deep-focus cinematography that really show off the anamorphic format. The glass is by Nikon. The lenses are very fast (between T1.4 and T1.8). There is even a 50mm that is T1.1. These lenses were used for night scenes with available light on ?Heat? for instance (in conjunction with Primos). 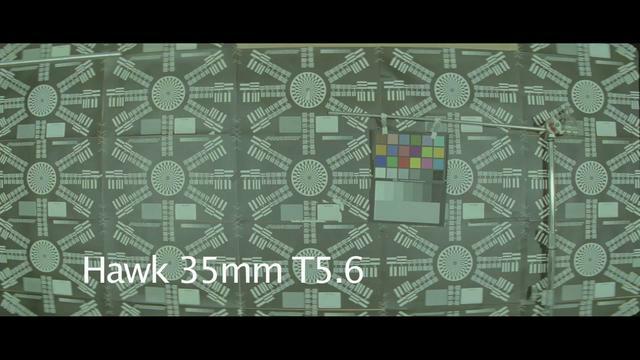 But they never shot the 50mm T1.1 wide open, they closed it down to T1.4, otherwise it would have looked too soft on the top and bottom of the frame. The E-series are Nikon. They are in general sharper than the C-Series and are better color matched. They are also faster but you give up the close minimum focus distance on the shorter focal lengths. The E135mm and especially the E180mm are great close-up lenses with the best minimum focus of any long Panavision anamorphic lenses. If you like to create horizontal flares, do tests, they will vary depending on the coating of the front element. The E180 will also slightly round off the top and bottom of the ovals when shooting wide open. Panavision have recently reglassed an E180 lens by adding a new set of relays to the system, effectively turning the lens into an E195, which is sharper and less milky than the initial E180. E-Series are Robert Richardson?s lenses of choice when he is shooting anamorphic (i.e. for ?Snow Falling on Cedars?). The latest Panavision lenses. They are all color matched but also heavy. Their focal range is limited, it only goes up to 100mm. Most people who shoot on Primos fill out their set with longer lenses from a different series, The lenses of choice being the E135mm and E180mm. The first Primos introduced didn?t have great minimum focus which is why they developed the Close Focus Primos (CFP). Of all the anamorphic lenses available, the Primos are technically the most impressive. Compared to all other lenses they have the least distortion and chromatic abberation. But as has been said before, the ?look? of a lens is more important than it?s technical merits. The 40mm and 100mm Portrait lenses are C-Series, as are the 55mm and 150mm Macro. The 90mm Slant Focus is a 45mm spherical lens with an anamorphic element at the back of the lens. The 40-80mm is a purpose build wide-angle anamorphic zoom. It is light enough to be used for steadicam. It has an anamorphic front element just like prime lenses and designed to match with the E-Series. All the other zooms are adapted spherical lenses. They are turned into anamorphic zooms by adding a small anamorphic element at the back of the lens, doubling their focal length and losing approximately one stop. Therefore it is impossible to get the typical horizontal flare with them. But they have the advantage of not distorting on the wide end and of not breathing as much as anamorphic primes. The 11-1 Primo made into an anamorphic lens (48mm-550mm T4.5) does not work well at all. Only at the longest end of the lens does it begin to perform. You really have to test a number of them in order to find a really sharp one that maintains focus throughout the zoom range. The focus can shift from one millimetre to another making this lens a less than desirable one to use more than you have to. In addition to that, you shouldn't shoot less than 2 stops down from wide open as your widest stop to keep the 11:1 looking sharp. A better alternative is the anamorphic Angenieux 10-1 HR which works well at both ends. As an anamorphic zoom the HR is also a better choice than the more recent Angenieux Optimo 24-290mm. The Primo 3:1 zoom (270mm - 840mm) is a terrific lens. With a lens speed of a T4.5, you can shoot wide open with it and maintain good sharpness across the field of focus. There are more recent, purpose build anamorphic lenses (Hawks, Elite) as well as adapted spherical lenses (Cooke S3s, Zeiss Superspeeds). The 2 companies responsible for adapting most of these spherical lenses are Joe Dunton Company (JDC) in the UK and Technovision in France. These lenses were initially BNCR mount, but have been or are being changed into PL mount, making them compatible with modern cameras. JDCs lenses are made with a Japanese Shiga anamorphic element. It is interesting to note that Panavision UK owns several sets of these lenses as well. There are also still a lot of older anamorphic lenses around (Lomo, Arriscope, Kowa, Ultrascope), but their image quality is not up to modern lenses. These lenses are designed and manufactured by Vantage Film in Germany. They are based on Russian design, but have since been independently developed further. Their main characteristic is that they have their anamorphic element in the middle of the lens (not up front like Panavision) which makes them more flare resistant. This design choice also means that if they do flare, one does not get the typical horizontal flares. The earlier (and lighter) version of the Hawks. Around 2 kilos, so ideal for steadicam and handheld. Their minimum focus isn?t as good (around 3?6? on the shorter focal lengths). They also flare easier, are less sharp and have more barrel distortion than the later Hawk lenses. These lenses are an improvement over the C-Series as far as sharpness, contrast, barrel-distortion and close-focus are concerned. This increased optical performance means a higher weight however (each lens is around 5 Kilos). The Vs may not be as sharp wide open as the Primos, but they have a more ?round?, organic look which looks especially pleasing on faces. Stopped down they become very sharp as well. There are 14 lenses in this series which goes from 25mm to 250mm. Recently (late 2006) Vantage Film have introduced the V-Plus Series which are a further development of the V-Series. These new lenses have increased optical performance, especially when it comes to flare handling. This new design is also tele-centric, so that the lenses can be used equally well on digital cameras. Compared to the Vs the weight of every lens has been reduced by up to 20% (around 1 kilo). The V-Plus Series also features 3 new lenses that were previously not available for the regular V-Series: a 65mm Macro, a 85mm and a 150mm, for a total of 14 primes. N.B. : 65mm, 85mm and 150mm only in V-Plus Series. The 46-230mm T4 Zoom is obviously not as good as the primes as far as sharpness and contrast are concerned, but it doesn?t have any distortion or breathing problems. But it needs to be stepped down at least 2 stops, wide-open it really lacks sharpness and good contrast. These are newly built anamorphics from Russia from the optical designbureau of MKBK. Unlike some other conversion lenses, all the glass including the anamorphot cylinders are new. The lenses are very clean and sharp and have a nice, contrasty look. The wide angles have a bit of barrelling to them, but nothing too extreme. Because the cylindrical element is in the middle, they are very flare resistant, even wide open. The curving focus field flattens out nicely when closing down a couple of stops. And this helps the contrast and color saturation. On the other hand the housing designs of these lenses does not seem quite as well thought out as that of the Primos or the Hawks. For the longer lenses it appears that they simply extended the cylinder while keeping the same elements and with all that weight out front it necessitates lens supports for all but the widest lenses. Elite have several zooms. The 50-160mm is lightweight for handheld/steadicam use. It has pincushion issues at the wide end and seriously suffers from the curved focus plane issue in anamorphic, plus it has some really oddball quirks like a zoom rate that is not consistent as you turn the ring (gets really slow near the telephoto). Both Technovision and JDC have adapted Cooke S3s. These lenses are not too heavy, very good for steadicam and handheld. The JDC ones are actually lighter, faster and focus closer than the Technovision series due to a different mechanical design. Compared to modern lenses, these lenses are not quite as sharp and also a bit more prone to flares, due to older lens coatings. Like all Cooke lenses they have nice contrast and are great for close-ups. There are a lot of Dops who still prefer these lenses over more modern ones. Panavision UK have several series of the JDC lenses as well (under the name of Cooke Xtal Express). They actually claim that they compared their sets to JDCs on the projector and theirs came out better. Once again both JDC and Technovision have adapted Zeiss lenses. And Panavision UK own several sets of the JDC series as well. These lenses are a mix of Zeiss Superspeeds and Zeiss Standards. As all Zeiss lenses they are quite sharp with average contrast. Panavision UK carry the Canon Xtal Express lenses in their rental catalogue, which leads to suspect that these are adapted by JDC as well. I have never heard of anyone using them, but they are priced identically to the Cooke Xtal Express (and more expensive than the Zeiss Xtal Express). They must be adapted from the Canon Ultra Speeds or Super Speeds which are lenses that are not really used anymore. The Clairmont anamorphics aren't necessarily the sharpest lenses in the world, but they are small and light enough to make you think you were just shooting a spherical movie. Clairmont had them built really for steadicam and handheld work. Stopped down, they worked fairly well. There are two generations of Todd-AO lenses. The first was designed by Dr. Richard Vetter for Todd-AO in the 1950s. They were manufactured in Japan by NAC, a division of Kowa for Todd-AO. Not many of them were build. They aren?t colormatched very well and have a warm tint. These are Russian lenses. It's important to make a distinction between the old square Lomo's, and the newer round Lomo's. They're two completely different designs. The older ones had the anamorphic element in front of the spherical assembly, making them breathe and weave quite a bit. ?Andrei Rublev? among others was shot these lenses. The newer round ones have the anamorphic elements in between the spherical assemblies, making them breathe very little. They were manufactured in the 1980s and are very good lenses, although not quite comparable to modern anamorphics like the Hawks or Primos. They are a bit lower in contrast as well. The 100m and 150mm are the 75mm with an extender added at the back. Beware of the newer 35mm, it distorts too much, besides being big and heavy. In fact, it's the one occasion where the nimble old Square 35mm has a slight upper hand. Based on the same design as the Elites. A collaboration between Arri and Isco-Optic in the early nineties. These lenses are very resistant to flares, but breathe a great amount and are also heavy. They were never used much. Arri Rental (Germany) does not rent them out anymore, but sold most of their sets to India. Japanese lenses that are no longer manufactured. The British film ?The Great Exctasy of Robert Carmichael? was shot on them. Mike Valentine BSC used these lenses for among other things the underwater sequences in Star Wars Episode 1. They are older as well and not really used much anymore either. These lenses were made for Arri by the Ultra Gesellschaft für Optik from the late 1950s to mid-sixties. They were alright for their time, except for their zoom. Technovision have these lenses in their rental catalogue. They are the lightest anamorphic lenses available, but are not as sharp as modern optics. Eric Gautier used them on an Aaton 35-III for the ballroom sequence in the film ?Les Destinées Sentimentales?, which otherwise was shot on the Technovision Cookes. I would like to make a correction concerning the Todd-AO 35 system. The first was designed by Richard Vetter for Todd-AO. The focusing system is patanted. They were manufactured in Japan by NAC, a division of Kowa for Todd-AO. The second generation, which are the high speeds, 24mm T1.6, 35mm T1.4, 55mm T1.4 and 85mm T1.4. Cinema Products, which was the US distributer of the Canon High Sreeds, bought the Todd-AO 35 name. These are basicaly the same as the Canon Xtal Express, only with the first generation Canon High Speeds. Could anyone tell me if teh procedure to do flange testing on an anamorphic lens ? Thank you. We use squeezed charts for the lens calibration tests. As Max said, you must do the shooting test at two different stop apertures : wide open and closed 1 stop. The focus marks should be different, but remain the same for closest apertures. Remember it's recommended not to work at a wider aperture than T 4. The test has to be shot at 50 times the focal length, printed on positive stock and the print test examined under a binocular magnifying glass. Notice the ellipse will look as a circle on the squeezed positive. Read the two directions and the seven (or five) charts. Use a 50 mm for registration pin and frame test (with no need to print these tests), and a 20 mm for the ground glass and camera FFD. Thanks to Pierre Coque, Panavision Alga Samuelson, Paris - Vincent Platerier, Mickaël Lemercier, Panavision Marseille France. As Max said, you must do the shooting test at two different stop apertures : wide open and closed 1 stop. The marks should be different, but then remain the same for closest apertures. Remember it's recommended not to work at a wider aperture than T 4. The shot test has to be print on positive stock and the print test examined under a binocular magnifying glass. Use a 50 mm for registration pin and frame test (with no need to print these tests), and a 20 mm for the ground glass and camera FDD. Hi Laurent, I'm about to test the close focus primo anamorphics out of panavision for a feature in london. i was reading up on anamorphics and came accross your very interesting post! Did you mean a 50mm for the steady test and a 20mm for the frame leader ('ground glass and camera FDD')? what did you find out from shooting the lenses this way? Kristi, I'm very sorry I find your post only now. I was going to give a link to the chart on my site where I just uploaded it with a better quality, since someone else asked me, when I found your post. Did you mean a 50mm for the steady test and a 20mm for the frame leader ('ground glass and camera FFD')? This is the way the technicians at Panavision France recommend to do. I actually was astonished when last week I went to Panavision Marseille, to find that they still use the same chart I learnt to work with almost 20 years ago. The copy just got a bit bad with years, that's all. The one I posted up here is the 20 years old (and best) one. The man who wrote them was a master in the art of optical craft at Panavision Paris, Pierre Coque, and is retired by now. But the main element is not that well defined. You then can make you own chart. Remember that finding out the focus calibration is a matter of comparision. The chart won't give you a figure for your lens' definition. There is a CST chart that allows you to determine definition (still @ 50 times the focal length) but I don't have a good copy of it, and it's expensive to get the original one). I was surprised to find out Blade shot with those lenses. It looked pretty good on the big screen as far as I remember. But it's interesting a newer film, I think 1998, would go with an older design rather than better Panavision stuff. Holy wealth of info, Batman! How about the new 6 in the G-series? I'm planing to update the page soon, but I'm still waiting on some info. I'll also include the new Hawks V-Lites. voiture simulation de credit immobilier en ligne - Simulation credit immobilier en ligne. L’Internet a rendu encore plus facile d’obtenir de l’aide pour trouver le credit immobilier. since you're talking about 35mm Anamorphic lenses here, I was wondering, are there any Anamorphic lenses for 16mm cameras, or the only way is to shoot with 35mm Anamorphic lenses? Search the forum for Hawk V Lite 16. They are purpose built for 16mm, both 2x squeeze and 1.3x squeeze, which is made for Super 16 and 16:9 sensors. they have a 14mm at their widest end. Brand new. has a film clip of a test shot with an 18mm and a 35mm 1.3x on Super 16. this link, http://www.vantagefilm.com/file/pdf/equipment_41.pdf also has info on lenses. still one of the best resources for anamorphic info... :) thanks Mr. Jacoby! Thanks Neil for advising me. I too have been doing research on shooting 16mm anamorphic. Does anyone see a huge issue with shooting with 35mm lenses? I'd like to shoot with the Panavision C-Series lenses to get a very classic anamorphic look, but it's been very difficult to find any information. Obviously shooting some tests before principle photography would be ideal, but I don't know if I'll be able to get the budget to do so. I'd also like to use a 2x anamorphic to get the most drastic effect. Which would lead me to shooting standard 16mm. Leaving me with a native aspect ratio of 2.66:1. I've considered simply leaving it as this aspect ratio. Would this be a huge distribution headache considering it wouldn't fill the entire screen? We will be entering festivals in 2k or 4k so I don't foresee an issue, but I'd like to hear other's opinion. The other option is to crop the sides, but I don't like the idea of loosing that resolution. Thanks in advanced for any tips/advice! Hawk V-Lite 16 2x is the best option right now. I have heard that Panavision has some 1.5x for S16, although it is just rumor. With a 2.66:1 image, you wouldn't be cropping that much. If you were to use the Hawk lenses, with todays stocks, it would look quite good and you could if you want to, have print dailies or even a photochemical finish. Plus I just realized the widest panavision lens in c series is 40mm. Not a good lens to get wide landscape shots. If I get the opportunity to shoot tests I will be sure to post. Do any of Panavision's anamorphic lenses produce a cylindrical perspective in the lower focal lengths? What's a cylindrical perspective? Do you mean the stretched bokeh? If so, then all the front-element PV anamorphic primes and zooms do, short or long. Except that the barrel distortion is not just happening horizontally. It's just normal barrel distortion being stretched out by the 2X expansion when shown a 2.40. A front-element anamorphic prime is like a normal prime with a wide-angle attachment in front, only the increase in view is only happening horizontally. But the side effect is barrel distortion. Anyway, all I'm saying is that this is the first time I've heard the term cylindrical perspective. Yes, wide-angle Panavision anamorphic primes show barrel distortion. Even the 50mm Primo anamorphic, which is a pretty high-quality lens, has a little barrel distortion but the 40mm and 35mm show even more.